The Dark Hendrickson Winged Wet is a fairly easy tie that uses readily available materials. Best of all, it is a real fish catcher. I couldn’t possibly tell you how many trout I’ve taken on the Dark Hendrickson over the past few years. 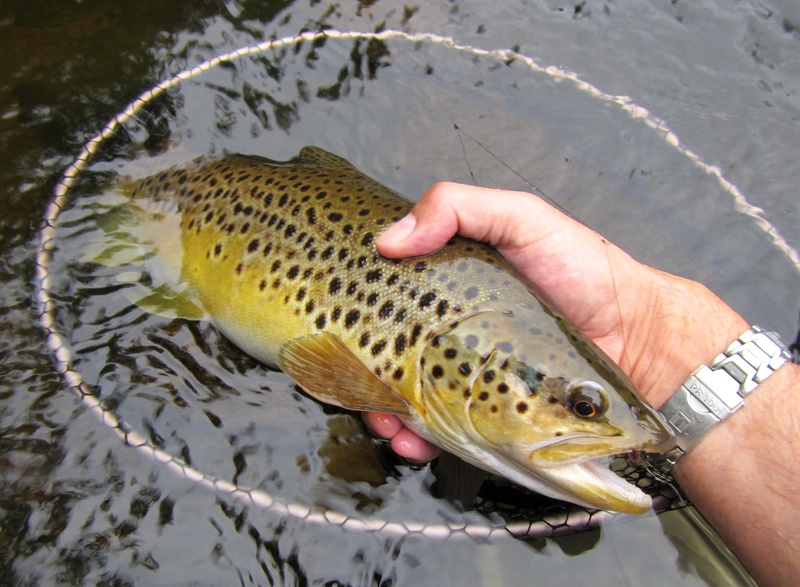 Match the size to the naturals on the river, pick out a rising trout, drift or swing the fly over its position, and hold on. A sunny day in late March can be misleading. On Friday, any warmth generated by the sun was fleeting, captured and quickly dispatched by a chilly, gusting wind. The water was only 34 degrees, well below normal for this time of year, lightly stained, and running at 450cfs in the upper TMA. There’s still plenty of snow on the ground that has to melt and become part of the ocean; until that happens, expect cold water. So, to the fishing. Well, it was what we in the trade call a slow day. Even the guys I spoke to who were fishing shiners were having a tough go of it. I jumped around the river, dedicated to the streamer cause, and the only trout I managed came by accident. I was messing around with the streamer, an articulated white and chartreuse bunny/bugger thing, to see how it looked in the water. Right in front of me, about ten feet away, and this brown rose from the depths and stomped it. Rather lucky than good, but we’ll take it. 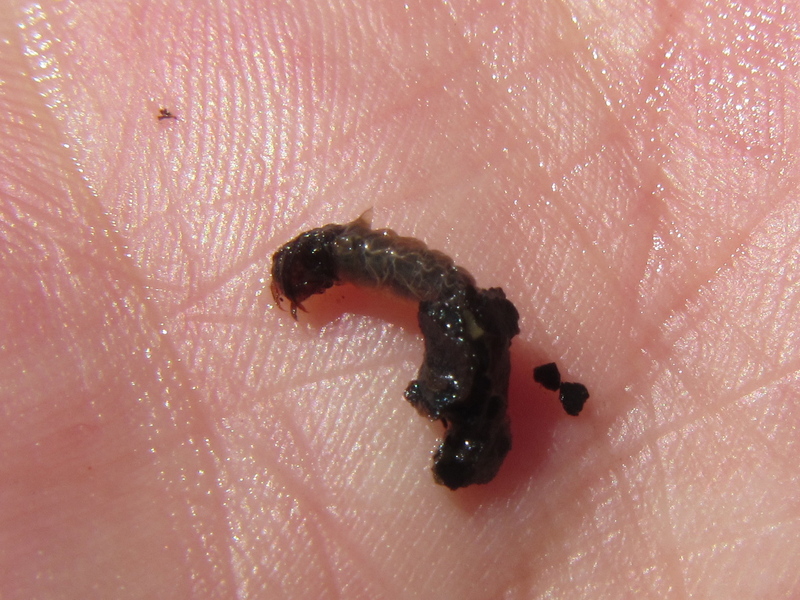 Cased caddis everywhere in the last spot I fished. I’m still amazed that a little wormy thing can build a house out of sticks. Please appreciate this photo. My hands and forearms were still cold about a half hour after I took it. An occupant. Sorry, little guy, for putting you out on the street. “March Brown” is a name you see attached to a lot of different wet fly patterns. 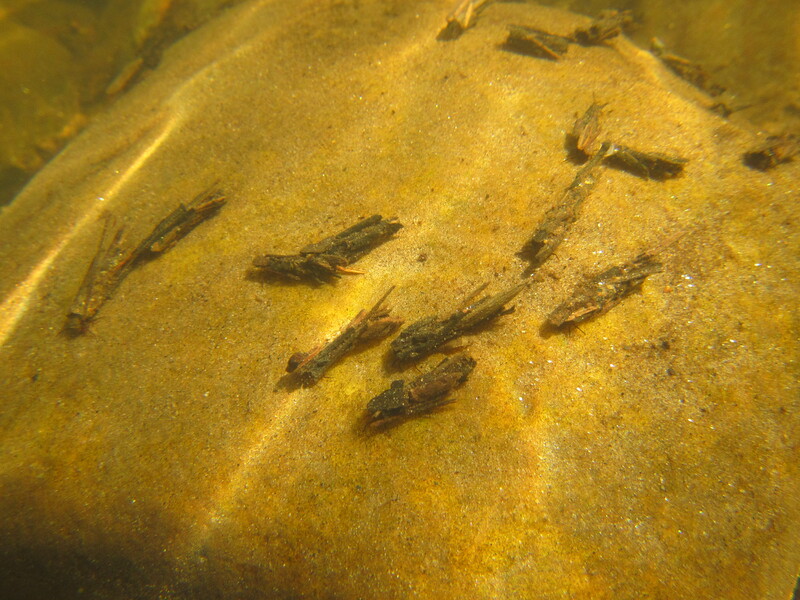 Some of them are caddis; others, mayflies. This spider is intended to represent the latter. I discovered it on page 116 of Sylvester Nemes’ Two Centuries of Soft-Hackled Flies. It was originally published in 1936 in an English book, Trout Fishing From All Angles. 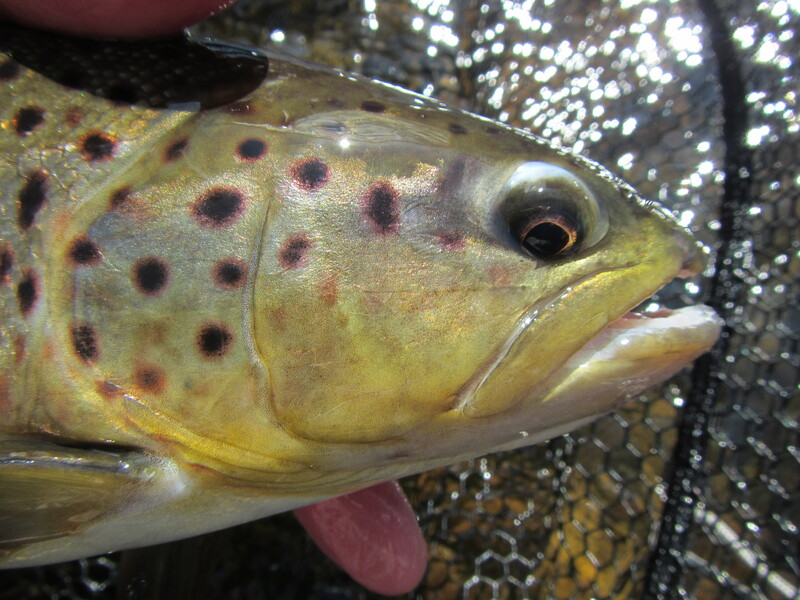 The Farmington River is not known for its March Browns; while we do experience that hatch, it’s not on the level of, say, Hendricksons or Sulphurs. But we do have a good showing of Isonychia, and I have taken to fishing the Hackled March Brown spider in the late summer to represent those substantial mayflies. Last August, I was fishing a snotty run that was studded with boulders and pockets. There wasn’t much going on hatch-wise, and I had the Hackled March Brown spider as the point fly on my team of three wets. The hit was one of unrestrained violence and brutality, such that it ripped the line from my hands. The trout went immediately on the reel; I never saw it until I was able to coax it into the shallows. Over twenty inches long, it was my biggest trout of 2013. 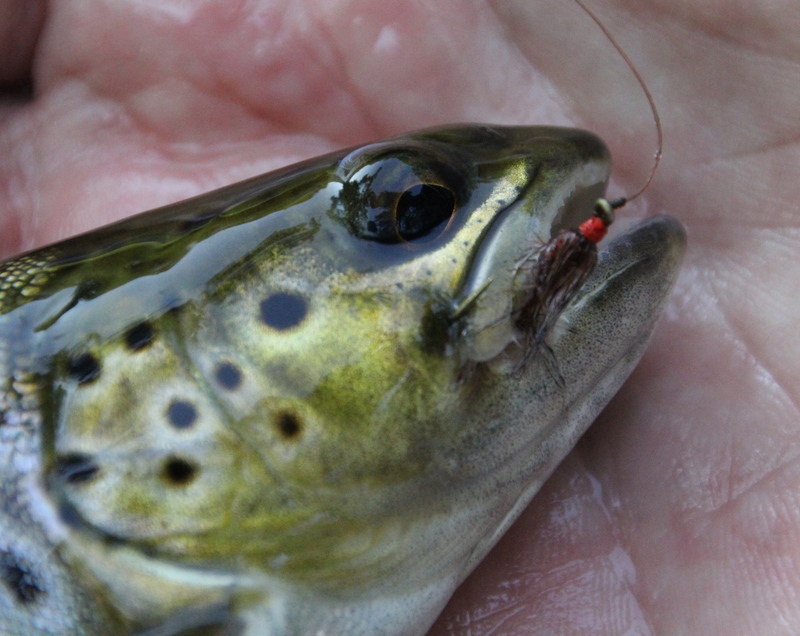 Tying notes: A straightforward, simple fly to tie. 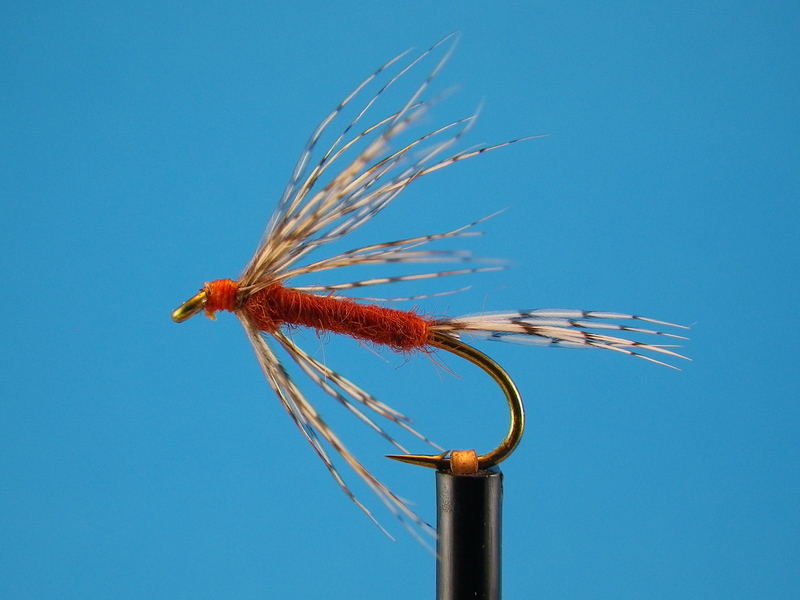 The original calls for a body of “hare’s ear dyed red ant colour.” I have settled on “rust,” and the trout seem OK with it. 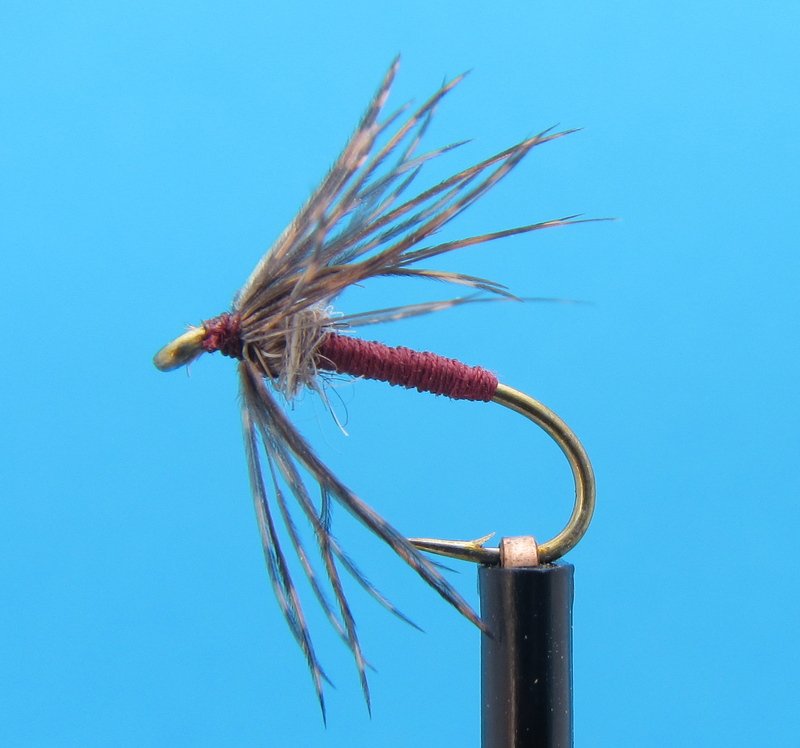 You could make the body a little buggier than I have here, but I like this fly with a thin profile. There are a multitude of brown feathers on a standard partridge skin; they’re located along the back of the bird. Also appearing on the show is my friend Steve Zakur from CVTU. Thanks so much to host John Kovach and HAN Radio for having me on. 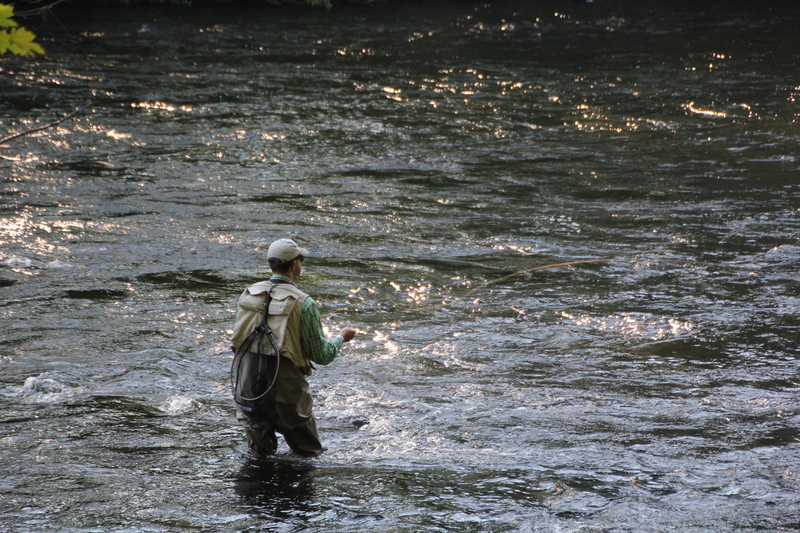 As its title suggests, Yankee Fisherman focuses on the ample fishing opportunities found in the Connecticut area. On Wednesday, April, 2, I will be at the Trout Unlimited Naugatuck Pomperaug Chapter meeting in Naugatuck, CT. The meeting starts at 7pm, and you can get directions at tunaugpomp.org. On Tuesday, April 15, I will be at the Trout Unlimited Thames Valley Chapter meeting in Bozrah, CT. The meeting starts at 6:45pm, and you can get directions at thamesvalleytu.org. I also did my first radio interview today for John Kovach’s Yankee Fisherman show on HAN radio. The subject was wet flies, and I’ll post a link to the show when they put it up. I had my heart set on dredging up a big ‘ole brown on a streamer, but ’twas not to be. Hard to be sad about a skunking when you’re enjoying an El Rey Del Mundo Flor de Llaneza on a sunny Tuesday. Many thanks to the Mianus Chapter of TU for hosting me last night. “Wet Flies 101” was the topic, and we had a roomful of enthusiastic, welcoming anglers. I’ve never presented in a mansion before — that was rather posh. No matter what venue I’m in, it’s always gratifying to be able to spread the wet fly gospel. Thank you again.